High Heel Caps prefect you from sinking into the lawn, cracks in sidewalks, grates, wooden decks and cobblestones. Beauty's good helper. *Durable rubber material to ensure wear-resisting and reduce the noise. *Thread bottom of the high heel protector to prevent you from slipping. *Three sizes, two colors, to meet your request of different shoes high heel. *Perfect high heel caps for lawn wedding, outdoor parties or walking etc. *Fits all kind of shape of high heel. Lightweight, to ensure store and carry easily. *We promise one year warranty, to offer you a good experience of shopping. Our products tested and improved constantly to ensure the best quality. 100% refund if you are not completely satisfied with purchasing products! Please feel free to contact us if you have any questions of the products. 【Prevent You from Sinking into Lawn】This high heel stoppers which prevents heels from sinking into the grass, cracks in sidewalks, grates, wooden decks and cobblestones. Perfect heel stoppers for walking in lawn when you attend lawn weddings, outdoor parties and etc..
【Reduce Noise and Antislip】The shoes heel protectors are made of flexible durable rubber, wear-resisting and reduce the noise of high heels. The high heel protector with threads in the bottom which provides extra traction and friction to prevent you from slipping or tripping. 【Fits All Shape Heel and Storage Easily】The heel caps almost fit all shapes of heel: round, square and U-shape. Heel protectors comes with a durable pouch, easy to store and carry, you can bring it with your handbag. 【Multiple Matching for Your Shoes】There are three sizes of the high heel stoppers: S, M, L. You can choose it according to your different size shoes heel. 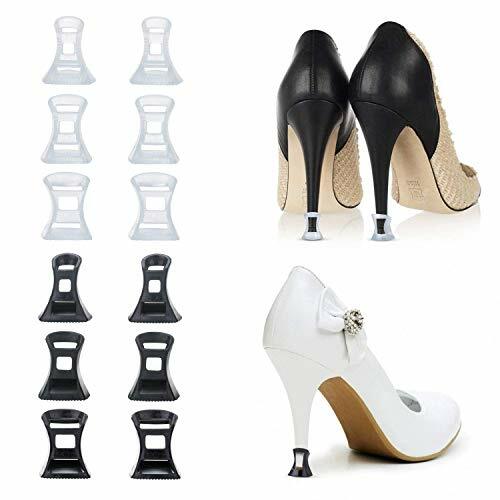 This item includes three pairs transparent stoppers and threr pairs black stoppers, perfect for you to matching your different color high heel shoes. 【After-sales Guarantee】1 year warranty. Our High Heel Stopper tested and improved constantly to ensure the best quality. 100% refund if you are not completely satisfied with purchase! Please contact us freely if you have any questions. If you have any questions about this product by BEIAOSU, contact us by completing and submitting the form below. If you are looking for a specif part number, please include it with your message.